One of Ireland’s most scenic roads skirts the southern side of the Corruan Peninsula in County Mayo, giving breathtaking views of Clew Bay and Clare Island. Travelling towards Darby’s Point from the Mulrany direction, the southern end of Achill Island will launch into view as you near the point. Just to the left, two low hills may be seen with a small secluded beach in between – at first glance it is another part of Achill Island, but a closer look reveals that these two hills are seperated from the rest of Achill by a narrow channel, the Blind Sound. These two hills, with the narrow valley between them, make up Achillbeg Island, a small piece of Ireland some 60 hectares in area, and an individual little world in itself. 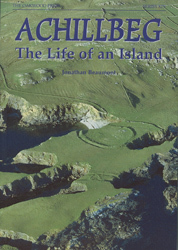 The name Achillbeg comes from Acaill Beag, or ‘Little Achill’. The island’s wild and beautiful scenery has been shaped by the wind and strong sea currents, as the Atlantic pounds the exposed rocky coastline. By 1000 BC, Achillbeg was certainly inhabited, as it is from around this era that the spectacular promontory fort at Dun Chill Mhor dates. Before the ravages of the Great Famine the island’s population was almost 200, but by the early 1960s barely a sixth of that number remained and the school enrolment was down to single figures. Despite the introduction of electricity and a phone line, the end was in sight, and the remaining inhabitants moved out in 1965. Much of the land is still owned by the families of those who left, and many surviving islanders live on Achill within sight of their old home, but Achillbeg is now a haven of peaceful solitude. Several old cottages have been renovated as holiday homes, and the electricity link remains to service both these and the automated lighthouse. The rest stand silently, abandoned under the wide western Mayo sky. This book is the first study of this beautiful island, and has been painstakingly researched using the memories of former residents as the primary source. A5 format, 208 pages, with 180 photographs, etc.